Schools showcase a nation’s past, present, and future. They represent the hopes of parents, capitalize upon the aspirations of the very young generation, and respond to the needs and challenges facing the society. ILM Trust initiated the project of The Knowledge School (TKS) to contribute towards the development of new generation, turning them into self-directed life-long learners. The students of TKS become aware of the purpose of life and they discover their unique strengths and talents for refinement. We are building a knowledge community to lead Pakistan. Human beings know no limits to excel and each generation surpass the previous in all respect. At TKS, we aim at becoming a very reliable partner of the parents and society to make each student a truly great person with extreme motivation, creative ideas and supreme talents so that they can achieve extraordinary goals and objectives. Established more than a decade ago, The Knowledge School Network aims to improve opportunities for children and young people in Pakistan and equip them with the knowledge, skills, strategies, and values that will allow them to excel in a fast-paced and competitive world. Through its affiliations and initiatives, TKS aims to push the boundaries of education across the region within and beyond the classroom, and to promote positive change and counter the stagnation and decline of quality education and learning outcomes. Pakistan’s key resource is its people and investing in their education and skills is of paramount importance to Pakistan’s socially inclusive development and its global economic positioning. In Pakistan, TKS aims to become a reference point on educational change, and to serve as a hub of new ideas for education and development.TKS will also act as an incubator for new educational programs. 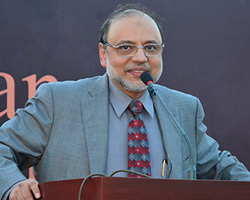 The identification of these new program, which address educational gaps and needs in Pakistan as well as respond to opportunities for innovative approaches, is based on research and field experience and reflects Dr. Hasan Sohaib Murad’s vision for education reform.